The church of the Sagrada Familia, perhaps more than any of Gaudi’s earlier works, expresses his belief that a ‘mystic symbolism inhabits the form of architecture.’ (Schmutzler 1962, 212). The church was a lifetime commission and remained uncompleted upon his death in 1926 – a reflection of the ambition and scale of the project. It has been described as the most important ecclesiastic building since the late eighteenth century (Schmultzer 1962, 227) with its most poignant features being the rich decoration and towers with their Expressionist shape and form. On the approach the eye is caught by the spindle-shaped towers ascending to differing heights. They were designed to represent the twelve Apostles, the Evangelists, Mary, with the tallest representing Jesus. One is immediately aware of the importance of verticality in Gaudi’s design – both in the exterior and interior. The towers are yet to be completed, with work currently underway on constructing the tower of Jesus. However, the finished towers are strikingly tapered, standing proud against the skyline. Gaudi was a great believer in the importance of spiritual meaning in architecture and this is reflected in the placing of a symbol of each apostle on the highest point of each tower – on the meeting place between the sky and the extent of the structure. The towers are decorated with “Hosanna”, “Excelsis”, and “Sanctus”, and the doors of the Passion façade reproduce words from the Bible in different languages. Yet the placing of the symbols in such a prominent position is paramount here as it suggests that a language of symbols, without words, is the ultimate form of communication between man and God. 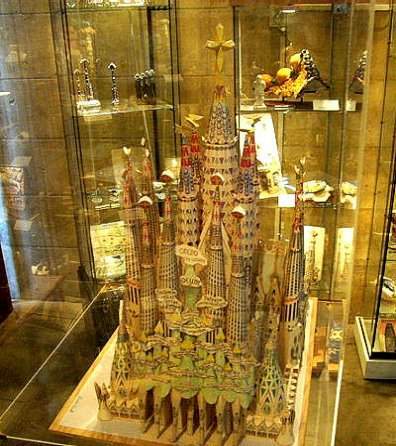 This image of the structure tapering to a single point, with all its supporting towers, illustrates Gaudi’s belief in the human effort to have faith in the single, omnipotent presence of God. This sense is conveyed upon entering the church when one becomes fully aware of the monumental scale of the structure and the diversity of forms which are incorporated into the design. Gaudi wanted to disassociate himself from the Gothic features of existing cathedrals, such as Chartres, where flying buttresses and external buttresses are an expected feature. The interior arches are thus not common in western architectural tradition and use non-circular shapes, called ‘parabolic’ or ‘catenary.’ (Huerta 2006: 324). The arches of the interior and the towers of the exterior both seek the same lines of ascension. Furthermore, there is a twofold sense of the infinite in both the interior and exterior design: firstly, the fact that the plans – for both inside and outside – have still not yet been executed illustrates how Gaudi’s ideas transcended the timeframe in which he had to work – and might even exceed the 100th anniversary of his death. Secondly, it is evident that Gaudi wanted the finished Sagrada Familia to be a structure of indefinite permanence – this can be seen in his use of weight bearing columns instead of flying buttresses. He refused to use the gothic buttresses, stating that they were akin to the ‘crutches of a cripple.’ http://www.gaudiclub.com/ingles/i_vida/i_sagr2.asp. Furthermore, the fact that his buttresses were inside the building was imperative to him, as they avoided being subjected to the elements, which would have accelerated their deterioration and threatened the building’s permanence. There is perhaps even a symbolic meaning to this inclusion of the buttresses: it might suggest that spiritual strength in a human being – as well as a building – is internal and people should look within themselves for the way to communicate with God and not to others, or the material world. The Sangara Familia appears from the outside as a slender, insurmountable form, with the towers having an organic texture, like that of a honeycomb or wattle. This might be Gaudi suggesting that the natural world is imbued with spiritual importance – with features such as the honeycomb – having an intrinsic place within God’s design. As it has been said of Gaudi’s work, ‘artifice is made to resemble nature and nature to resemble artifice; contradictions are harmonized; planes, lines and intersections are constrained; the subtle and the hazy are cast in bronze and set in stone; music is injected into the solid, colour into the air, and even soul into mathematics. (Cassou et al 1962, 23). This tendency of Gaudi’s to decorate and design using natural imagery is continued in the interior with a richness of decoration and the inclusion of spiral staircases in the apse and bell towers. In the windows of the apse there are many features which are inspired from nature, and are enhanced by light and shade contrasts. http://www.sagradafamilia.org/eng/index.htm. The subtle play on light in the interior is developed more expressively on the extravagant and diverse exterior facades, where the Nativity spires have colourful textured surfaces made of Gaudi’s technique of using mosaic tiles and broken Venetian glass. Figures of an emancipated Christ are juxtaposed against this rich decoration. Indeed, Gaudi has been described as not just an architect, but as a sculptor too, possessing the ‘ability to imbue structures with sculptural qualities, to conceive of architecture as a large shape that can be experienced tactually.’ (Collins 1962, 10). Yet his techniques differ considerably from one part of the church to the next. In the inner façade of the transept we see geometrically pure, rectangular, rectilinear, or cubic forms (Schmutzler1962:,227), radically different to the prismatic external towers. It is as if he wanted his building to be prophetic, to see beyond the time of which it was born to the more dynamic eras ahead. This is reflected in his diverse style and his intention for the building to be illuminated at night to ‘proclaim the Almighty God.’ (Collins et al 1962, 161). He thus gave the spires openings where searchlights were to be installed, focusing on a huge cross on the central cupola and on the street below, reflecting his wish that the building’s presence could be felt and seen by all those in its vicinity, and for a long time to come. "Church of the Sagrada Familia | Architecture Analysis." UKEssays.com. 11 2018. All Answers Ltd. 04 2019 <https://www.ukessays.com/essays/architecture/church-sagrada-familia-architecture-4011.php?vref=1>. "Church of the Sagrada Familia | Architecture Analysis." All Answers Ltd. ukessays.com, November 2018. Web. 19 April 2019. <https://www.ukessays.com/essays/architecture/church-sagrada-familia-architecture-4011.php?vref=1>. UKEssays. November 2018. Church of the Sagrada Familia | Architecture Analysis. [online]. Available from: https://www.ukessays.com/essays/architecture/church-sagrada-familia-architecture-4011.php?vref=1 [Accessed 19 April 2019]. UKEssays. Church of the Sagrada Familia | Architecture Analysis [Internet]. November 2018. [Accessed 19 April 2019]; Available from: https://www.ukessays.com/essays/architecture/church-sagrada-familia-architecture-4011.php?vref=1.